Etihad moves on Air Berlin and the world’s aviation axis shifts. What will Willie do next? Etihad’s already anticipated acquisition of a large minority share in Air Berlin will surprise few, but its potential to alter the global balance of international airline activity may well cause major ructions in 2012. Lufthansa sees the Gulf carriers as its biggest threat as they perfect the art of sixth freedom operations; and to have the fastest growing of them established in its own capital city will shake more than the balance of power in Germany. For Etihad’s move is surely just one step now in breaking down the sharp division between, on one side, the new generation airlines and, on the other, the established European big three of Lufthansa, Air France-KLM and British Airways-Iberia (International Airlines Group, IAG). The latter, a leader of the oneworld alliance to which airberlin will shortly belong, is also, under Willie Walsh’s leadership, patently on the prowl for new and probably surprising ventures. Etihad’s timing was immaculate, as airberlin’s shares were languishing. CEO James Hogan has engineered a globally significant industry change – and managed to achieve it at a knockdown price. airberlin was facing a cash squeeze and something of a strategic conundrum, having made a transition from low-cost airline to a hybrid/full service airline under its founder and CEO, Joachim Hunold. Since he stepped down in Aug-2011, the airline has had to confront an increasingly brutal European marketplace, with a dubious economic outlook. With yesterday’s announcement, Etihad has increased its ownership in the German carrier from the previous 2.99% to 29.2%. It paid EUR72.9 million (USD95 million) to acquire 31.6 million newly issued shares. And Etihad is to provide financing support for up to USD255 million for airberlin’s planned aircraft deliveries over the next five years. The German airline is already large, Europe’s seventh biggest, with a fleet of 143 aircraft and another 65 aircraft on order, of which 20 Boeing 737s were due to arrive next year. However, a steep cost cutting programme is likely to see that timetable amended – one of those areas where a partner like Etihad may be able to lend more than moral support in negotiations with manufacturers. The announcement that Etihad was increasing its shareholding had an immediate positive effect on airberlin’s share price. 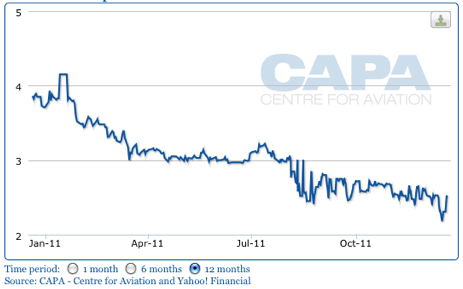 The acquisition also means that airberlin’s stock register is now more tightly held. The issue of new shares, due in 1Q2012, will dilute the others, which include Esas Holding AS’ 16.5% holding, original investor Hans-Joachim Knieps, who held 7.5%, and TUI Travel PLC, with 6.9%. Despite their reduction in overall participation, the other shareholders will undoubtedly be relieved at the new force behind the Berlin carrier. airberlin’s shares have been in steep decline over this past year, something that Etihad’s intervention should reverse, rising around 12% yesterday. Etihad’s arrival on the scene will not only put to rest many of airberlin’s financial concerns, but also help elevate the potential for evolving into a powerful European airline force, capable of competing with the might Lufthansa. Synergies will almost immediately be introduced. Etihad will take over airberlin’s Bangkok operations and, as of 15-Jan-2012, airberlin’s current four times weekly Berlin Tegel-Dubai service will be transferred to Abu Dhabi, Etihad’s base (and the Tegel service will transfer to Berlin Brandenburg when that airport opens). Rival Emirates is unable to fly to Berlin as it is restricted to only four points in Germany. Etihad will codeshare on 36 of airberlin’s 171 destinations and airberlin is to codeshare on 24 of Etihad Airways’ 82 passenger destinations, with plans to expand this pool further. Etihad will also codeshare with the Air Berlin Group for all European activities including NIKI and Belair. For global aviation, the shock waves will almost certainly reverberate strongly, almost certainly catalysing a number of other important structural moves already in the pipeline. Etihad has been in discussions with several of Europe’s major carriers in recent months and IAG chairman Willie Walsh too has made no secret of the fact he is interested in more acquisitions and partnerships. Announcing the completion of the British Airways-Iberia merger in Jan-2011, the then British Airways (BA) CEO made clear that was only one step towards increasing the group’s global dominance, seeing the future as a “multinational, multibrands airline group”. The carrier’s intention to be involved in further acquisition activity was part of the reason the holding company’s name, International Airline Group, is deliberately vague. Mr Walsh in Sep-2010 stated he had drawn up a shortlist of 12 international carriers identified as attractive investment or acquisition targets (down from a list of 40), adding that Asia, Latin America and Europe offered the clearest opportunities. At that time, Mr Walsh commented: "With Iberia, we have had a number of meetings where we have looked at airlines around the world and identified those that would be attractive to us in joining IAG. We are creating IAG in a way to ensure that it is scaleable and attractive to other airlines that might want to join us. This is just to give us a focus. We have not had any discussions with any airlines. There is nothing going on at the moment, we would not pursue all 12.” Mr Walsh later made it clear that Gulf airlines were also very much on the radar in this context. It is no secret that Etihad and BA have since talked around the issue in more than passing detail. And now that Etihad is very much engaged in a continental European airline, the gravitational forces pulling the two together will only get stronger. British Airways has a considerable interest in airberlin’s future role as a oneworld member. For example, a revived Japan Airlines (JAL) has said it is anxious to have better access to the continental European market place than BA can offer it over London, specifically citing its longstanding close relationship with Air France. The British carrier would not want to see its very important partnership with JAL diluted in this way and hopes to use airberlin to leverage its presence in Western Europe. Then again, British Airways/IAG is also very much the motive force in a recently forged partnership with Malaysia Airlines (MAS), having invited it into oneworld. The prospect of more than a multilateral relationship is strong, in light of Mr Walsh’s earlier comments. MAS would offer the group a very solid platform into Southeast Asia. The Malaysian carrier has since also been the target of investment by local LCC AirAsia, more aligned to the Virgin Group (which has interests in the associated AirAsia X long-haul operator). Aside from JAL (and Qantas in the South Pacific), oneworld is light on representation in Asia Pacific. Cathay Pacific remains ambiguous in its allegiance, given its equity and operational ties with Star’s Air China and the level of its direct competition with neighbouring JAL and with Qantas, codesharing with neither. On its own doorstep is the unresolved matter of a BMI sale, along with a horde of valuable London Heathrow slots. Slots which become even more valuable for a long-haul widebody airline operator. Meanwhile, British Airways’ lead partner in the oneworld alliance has recently entered Chapter 11 bankruptcy protection, offering yet another opportunity for equity injections – although the US’ fiercely protectionist Congress and unions have in the past left several other foreign airline interests shaking their heads as they walked away from painful investments in US airlines. Would Etihad ever join oneworld? Just as Emirates sees itself as effectively a self-standing alliance, the global presence of a major Gulf carrier can create conflicts within any partnership with an existing long-haul sixth freedom operator. For the European majors, whose long-haul operations are having to underwrite losses in their short-haul markets (thanks to stiff competition from LCCs like easyJet and Ryanair), this can make for a difficult equation. Passing the profitable part of the operation to a Gulf carrier changes the whole nature of the airline – unless there are spinoffs. Given the rapidly expanding range of options offered by the newer airlines, these spinoffs, for example, in terms of new and improved route access, are growing daily. But viewed from the other side, although they are mightily efficient in linking continents, the Gulf carriers suffer from the disadvantage of not having access to “internal” connections, whether they be domestic or intra-EU routes. By leveraging the opportunities for connectivity, European airlines can therefore present a useful contrapuntal opportunity for, say, Etihad. airberlin, with a much lower unit cost (albeit lower revenue per seat kilometre) than the longer established operators, does therefore offer a powerful hub opportunity for both carriers, as it distributes traffic within and across Europe and beyond. Here 1+1 can quickly equal 3 or more. But Etihad does also offer the opportunity for airberlin to reduce its less attractive long-haul routes, while opening up many new opportunities. Lufthansa CEO Christoph Franz last week announced to staff that the carrier will launch a new cost-reduction plan in early 2012, saying “we need a significantly higher operating margin in the medium term". Management will be regretting its lost opportunity to link with Etihad, as airberlin is now not only reinforced financially by the new partnership, but also becomes a much more competitive airline force overall. The flag carrier has faced stiff opposition from its pilots and other unions in most of its attempts to introduce more efficient ways of working throughout the now-expansive group. Paradoxically it could be that the added threat of enhanced competition from airberlin will induce a greater logic into those negotiations. 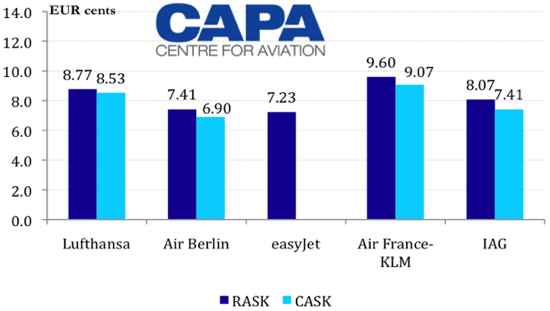 Lufthansa remains one of the higher cost operators in Europe and has been unable to exploit fully the lower cost base of acquisitions like SWISS. Lufthansa’s greatest concern – and its preoccupation in bilateral negotiations with the UAE – has been to limit the UAE carriers’ access to the German market, for fear of undermining its German hub activity. So the news that airberlin and Etihad jointly “plan to increase (the number of weekly flights between Germany and Abu Dhabi) to 42 flights from mid-April” will not be welcome, an increase from the current 29. Making life tougher for Lufthansa will be the fact that airberlin has generally matched its bigger opponent’s geographic presence in Europe, as its organic and acquisitive growth saw it established in territories where Lufthansa walks tall: in Austria, through Niki; in Switzerland, through Belair; and in Turkey, through its indirect equity relationship with Turkish LCC, Pegasus, whose parent is airberlin’s 16.5% shareholder Esas. Until now, airberlin’s weaker financial standing has meant that this has not been especially threatening. With Etihad as a partner, these positions can now be greatly enhanced. The measure comes at a time when Berlin’s three airports are about to be consolidated into one, at the new Berlin Brandenburg Airport, in mid-2012. The capital city airport replaces smaller facilities (on an expanded Berlin Schoenefeld site) which had previously restricted air services to point to point, primarily domestic operations, but the new management makes no secret of the fact that it will be pursuing a new international hub role. Etihad will be keen to use its Abu Dhabi hub for long-haul connections, but there is strong potential to increase connecting short-haul services into Brandenburg, just as the new partnership should help secure the viability of airberlin’s long-haul non-stop operations. But the biggest changes may well be yet to come. Willie Walsh predicted last year that 2011 would be the year for mergers and acquisitions. He was probably a year premature in that estimate. And, as 2012 approaches rapidly, he may well play a considerable role in how that scenario emerges next year. And although Mr Hogan has said there will be no further investment in airberlin, he has explicitly left open the prospect of further investments. The Etihad-airberlin move, in crossing the boundary between the old and the new markets, has signalled that anything is now possible. 2012 promises to be even more interesting as a result – even perhaps a pivotal year for global mergers. It is about time.